Crimson Pygmy Dwarf Barberry - Buy from Michigan Bulb Co. 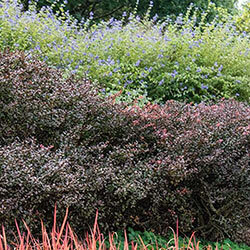 Throw your primarily green garden a welcome curve by adding some rich deep red foliage to the mix. 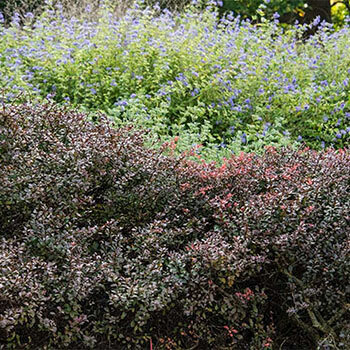 Crimson Pygmy Dwarf Barberry will create a color contrast that will benefit both. Use its height (18–24") and spread (30–36") to fill out a mixed border or complement nearby, taller shrubs. This deciduous variety will thrive and spread without requiring much of your effort, making it useful for naturalized areas and rockeries. Deer tend to avoid. We're shipping it right now, more established and ready to put on a show. Soil Requirements: Thrives in average, well-drained soil. Avoid poorly drained, wet sites. Pruning: No pruning necessary excep to maintain shape. Pruning time - winter. Winter Care: No winter protection is necessary.